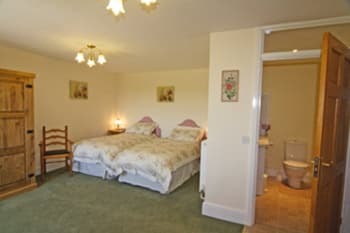 Whitehill Farm self-catering cottage has magnificent panoramic views, a homely atmosphere and comfortable spacious luxury 5 star accommodation for a quiet stress free break, whether you want a mini break, family holiday or escape for couples this is the perfect retreat. Enjoy the views when you barbecue or picnic on the 100 sq m south terrace overlooking the garden which is planted to attract birds and butterflies. The modern kitchen/diner has plenty of space with large oak dining table and top quality cooking facilities. Oak beams and cills are cut from our own trees The kitchen includes an automatic washing machine, tumble dryer, dishwasher, freezer, larder fridge and microwave. Three bedrooms with three bath/shower rooms. Enjoy the breath-taking scenery, fascinating heritage and wonderful hospitality of this border area, where Welsh and English influences blend. Croeso i Gymru! Welcome to Wales! There are no rooms available at Whitehill Farm Cottage for these dates. The number of times that we have stayed at Whitehill farm says everything about our love of the place.We stay 4 times a year through the various seasons and will continue to do so.Fabulous cottage,views,walks and Beryl is always delightful and welcoming. Monmouth town itself charming,there is so much history close by,including castles and stately homes.We try and book our break when there is racing at Chepstow,a great day out. Beautiful spacious cottage in a lovely setting. 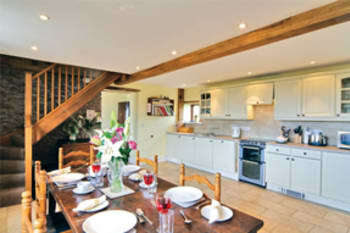 The kitchen was very well equipped and the whole cottage was spotless. We had a fantastic stay and would love to return. Close to Monmouth and some beautiful forest walks in the Wye valley. Great location, easy to book and to find property, walks from the door, friendly staff. We liked the Thai café, the Whole Earth, in Monmouth and the pub, the Clytha Arms. Beryl was very helpful, lovely Welsh cakes waiting on our arrival. Cottage well equipped and warm/Cosy we all enjoyed our 2nd stay here and would definitely come back again. Only stayed 4 nights, wish it had been longer. Lovely property and area but perhaps a little remote for some people. We loved it. thank you very much for taking the time to give me such a good review,I hope to see you again. Fabulous location with spectacular views. We took our dogs and there are great walks up through the woods from the cottage. Lovely downstairs open plan area and very spoilt with three large double bedrooms with two en-suite and one with bathroom. Loved our stay here and will definitely bc coming back. Lovely place, beautiful views and very helpful owner. Would highly recommend it. Lovely Italian restaurant in Monmouth. Monmouth is a lovely town with very friendly people and lots of history, worth exploring, also nearby Symonds Yat. A very comfortable and well-equipped cottage, with fantastic views! Ms Yeomans was friendly and very helpful. We enjoyed our stay very much indeed. Mokos restaurant Monmouth. Trading Post café in Abergavenny. 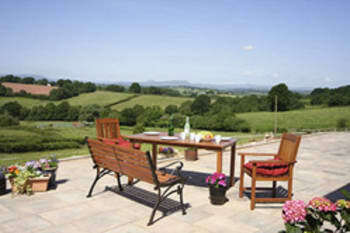 The setting of Whitehill Farm Cottage is wonderful, it was a wonderful place to relax and enjoy the beautiful views. Great walks around as well. Third time we've been this year and due to return in 7 weeks time,absolutely idyllic and always a pleasure to see Beryl. We arranged our dad's 85th birthday tea party here and it was just delightful. The setting is stunning and the cottage has everything you could need and plenty of space. Plus the chance for others to book at the B&B. Monmouth and Abergavenny are both lovely small towns to have a browse amongst the shops and plenty of choices to eat. Whitehill Farm Cottage is very spacious with very, very good facilities and it has the most amazing views....you could just sit on the patio for the whole of your holiday and not move...its so peaceful. The owner lives on site (on the farm) but does not interfere. You wake up to the sound of sheep and cattle in the fields, occasionally air balloons go over....its just perfect....would highly recommend. There are many castles, stately homes, gardens and pretty villages all within a short distance. A visit to the bird sanctuary is a must as is a trip on the Brecon Beacons steam train. So much to see. The cottage is lovely and very well equipped. The welsh cakes and tea on arrival were welcome. Nice patio area with large table and chairs allows you to enjoy the views from the cottage. The directions on where to find the cottage need a slight modification with the new housing estate. This requires you to turn left before the estate entrance. We had a lovely Sunday lunch at the Inn at Penallt and would recommend it. Superb location,top class accommodation,the whole family had a wonderful time.Nothing was too much trouble for Beryl,will definitely be returning as soon as possible.Idyllic. Beautiful cottage in a wonderful setting. This is one of the nicest cottages we have stayed in, very spacious and comfortable with everything you could want. Very pleasant and helpful owners, we shall definitely recommend this cottage and hopefully return ourselves. A wonderful welcome. The cottage is beautiful a home from home , it has everything you could possibly want Our dog loved the walks. Lots of pubs are happy for dogs to come in just ask. The Jewel Indian restyand take away is excellent. A nice walk in Monmouth park. Hereford is lovely especially the walk along the river. Our sixth visit. AND we plan to visit again. 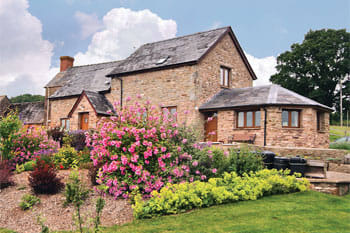 A perfect holiday cottage and a wonderful location. So much to see and do. Castles, mountains, rivers - all within easy striking distance and such delightful walks from the cottage itself. A very spacious and well equipped cottage with the most beautiful views. We had a very good celebration meal at the Inn at Panault. You must canoe down the river. Beryl, the owner, keeps Whitehill Farm Cottage in superb condition. The facilities are all that you could possibly require during your stay and the views from the front patio are breathtaking. You could not ask for more...it's our second year and there will definitely be more. Whitehill Farm Cottage is superbly positioned for excellent and varied places of interest. Do not miss Destow Gardens (only about 20 mins away), Raglan Castle - one of the best we've ever visited and if you are prepared for about an hours drive - the Dan Y Ogof Caves are spectacular. Excellent place to stay, hope to be back! As always, we received a warm, friendly welcome. We love the cottage & its location, quiet yet close enough to the town. The Boat Inn at Penallt is a great place for families (dogs included) a good range of ciders & great food. To avoid the narrow lanes drive to Redbrook, park for 20p & walk across the bridge over the River Wye. Also, The Rose & Crown at Tintern is great, Lovely people, great food and DOG FRIENDLY. A wonderful cottage in a wonderful location. Everything you could possibly require in the cottage. With wonderful walks. The owners were there if needed but totally unobtrusive. Will certainly be booking again.